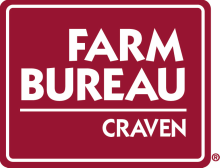 The Craven County Farm Bureau’s Young Farmers and Rancher’s program strives to promote agriculture throughout the county by engaging young men and women between the ages of 18 and 35 who have an interest in agriculture. ​Those in the program will develop their leadership and public speaking skills and stay well informed of agricultural issue that are affecting us today so they can make a difference in the future. They take part in programs at local schools by bringing farm equipment for children to learn about and reading agricultural books. In addition, they promote agricultural safety and make an effort to serve our community.